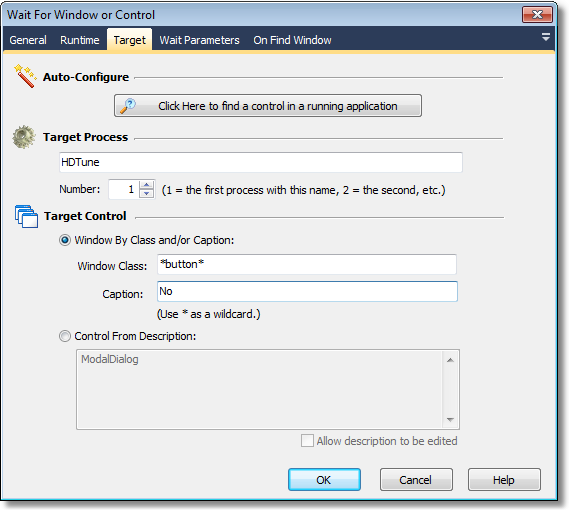 All of the GUI Automation Actions use the "Target" property page to describe the window or control that the action targets. While you search, FinalBuilder will place a red highlight rectangle around the control which is currently under the mouse pointer. Navigate to a point over the control that you want to choose for the action, and Control-Click to select it. All of the other fields on the property page will be populated with a description of the control. In most cases, this is all you need to create a reproducible description of the target control. However, you can fine tune the selection by editing each field on the property page. This is described in the Manual Configuration topic.